London (AFP) – Leicester return to action at the King Power Stadium on Saturday with football a mere afterthought as fans prepare to pay heartfelt tribute to the man who turned their dreams into astonishing reality. Manager Claude Puel’s pre-match preparations for the game against Burnley were disrupted after he and a number of players, including Jamie Vardy and Kasper Schmeichel, travelled to Thailand to pay respects to the late Vichai Srivaddhanaprabha. Leicester owner Vichai was killed in a helicopter crash just outside the ground along with four other people after his club’s 1-1 draw at their King Power Stadium on October 27. His shocking death — moments after taking off from the pitch — sent shockwaves through Leicester, where the charismatic Vichai had become a beloved figure in the club and the city — a feat rarely achieved by Premier League clubs’ billionaire owners. 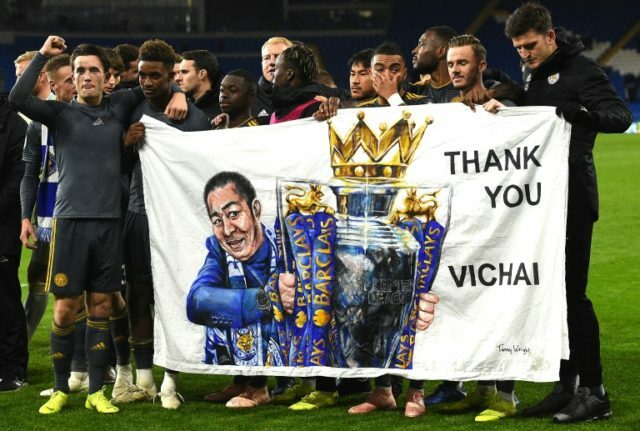 It was under Vichai’s ownership that Leicester crafted one of the biggest fairytales in English football history by winning the 2015/16 Premier League, having started the season as 5,000-1 outsiders for the title. The team, currently 10th in the Premier League, returned to action last weekend, beating Cardiff 1-0 away but Saturday will give a chance to a capacity crowd to show their appreciation for the man who transformed their club. A special “Tribute to Khun Vichai” video will be shown on big screens before kick-off followed by a two-minute silence and fans will receive commemorative scarves and souvenir matchday programmes in honour of the club’s late chairman. Tribute T-shirts will be worn by the players during their warm-up and Khun Vichai’s name will be embroidered on the team’s match shirts during the first half. The second-half shirts will bear the embroidered poppy symbol in honour of those who have given their lives in war, with the match selected as the club’s annual remembrance fixture, 100 years after the end of World War I. “We know our fans, they are fantastic… there were 3,000 of them at our last game in Cardiff, it was a fantastic reunion with the fans,” Puel said. Puel admitted preparing for the game against struggling Burnley had been tough, with emotions running high. “It’s not easy to prepare this game, but the togetherness between us all, it’s a good feeling, a good energy, a fantastic strength,” he added. “Our strength, spirit and positive attitude, as well as the support of our fans, will be very important. As well as official events at the stadium, thousands of fans are expected to attend the “Vichai Walk” from the city centre to the stadium in honour of those killed in the crash. Burnley forward Chris Wood, who spent two years at Leicester from 2013 until 2015, said the day would be “filled with emotion”. Burnley manager Sean Dyche and his coaching staff attended Leicester’s game against West Ham but left before the accident occurred.